We’ll have a little more discussion in the comments here later after the dust settles about the puzzles, but we hope everyone enjoyed today’s US Puzzle Championship. 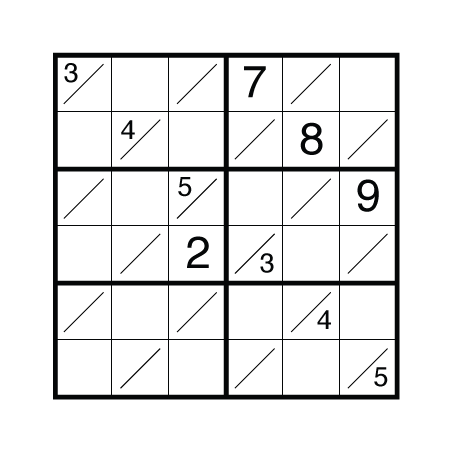 Here are the final puzzles from the US Sudoku Qualifying Test that I wrote. Both are less common types. Tomorrow will finally bring some new puzzles, and I hope some surprises too. The first of this set, a “Seek-and-Spell” variant, is a style that took on a life of its own on this website a few months ago as more and more constructors kept submitting it. 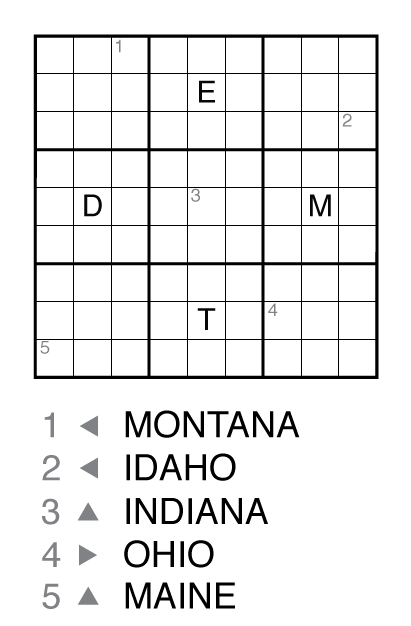 I wanted a very United States sort of puzzle somewhere on this test and found a good letter set to get 5 states into this grid. I wanted OHIO from the start as an easy Seek-and-Spell rule placement. But the value of states like MONTANA and INDIANA became clear during construction. This may have been the only case on the test where some non-sudoku logic puzzling skill would really accelerate the solve as the Seek-and-Spell placements are quite limited and getting them fixed makes the rest much easier. 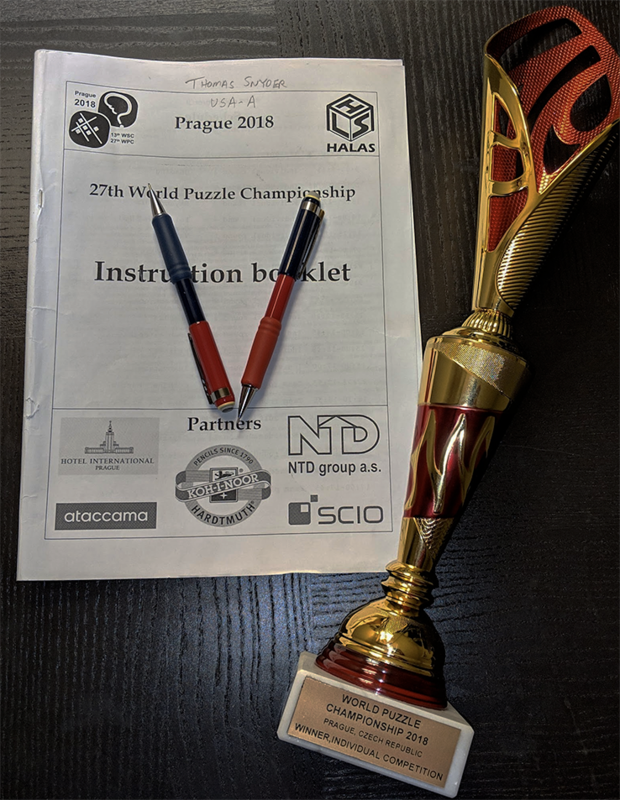 The second of this set is a style I first created for a Czech/US Sudoku Championship several years ago and one that I keep bringing out every year typically for championship season. 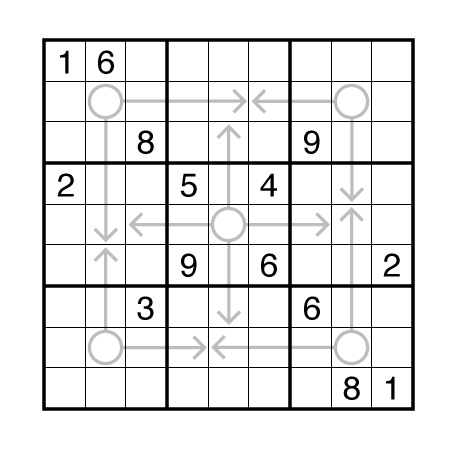 It is one of the easier styles construction-wise to get started with creative themes as it does not take a lot of digits in either grid before the linked cells really start to force the solve. But occasionally getting both grids to behave by the end can be hard. Here, my seeds were two different styles of basic step in the two grids. And after finding the linked regions, consistently ping-ponging between the two puzzles to get to the end. It is another of my favorites on this test. Not posted this week were the great submissions from Wei-Hwa Huang. This year I gave him a sketch of the styles I wanted and he delivered in a large way. 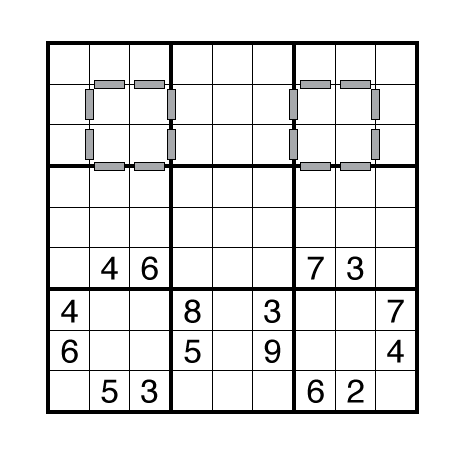 For example, I had a basic concept to play with Binary in a 6×6 grid with missing digits much like the Indian GP test had a play on this with Braille. Wei-Hwa took it farther than I did though with 0-7 and three bits being a perfect choice and his example and test puzzle were both quite fun. 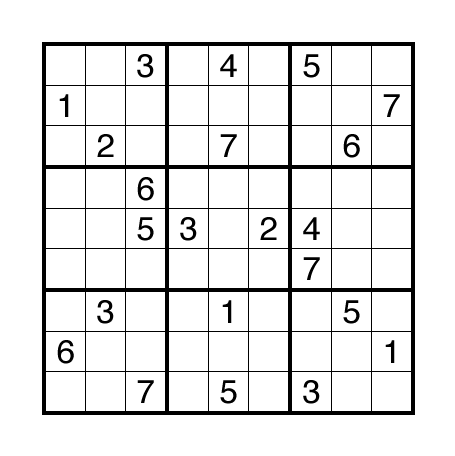 The Property Sudoku also had quite an elegant solve and his Diagonal had a good, but fair, challenge. 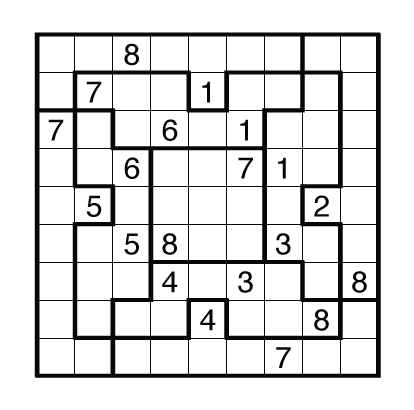 Rules: Standard Sudoku rules except that instead of the numbers 1-9 this puzzle uses the letters ADEHIMNOT. 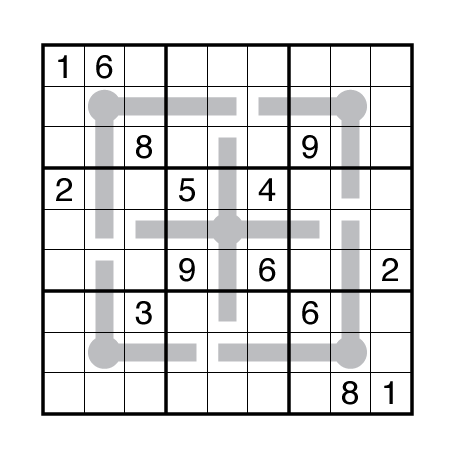 Also, clues in the grid represent typical “Seek and Spell/Kanaore” clues; specifically, it must be possible to read each of the words/phrases listed below the grid by starting at the indicated number, moving one cell in the direction indicated by the arrow, and then continuing to move one cell at a time up, down, left, or right to complete the word/phrase. No cell may be used more than once in a single path, but the same cell can appear in the paths of different words/phrases. Rules: Standard Sudoku rules for each of the two grids. 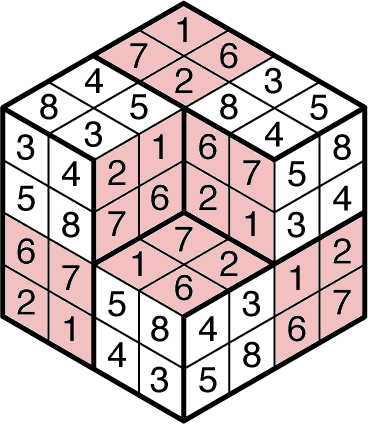 There are three shaded regions in each grid. 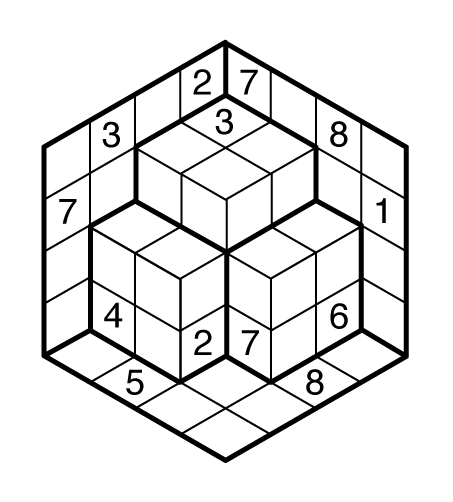 The shaded regions must exactly match between the puzzles, but which shaded regions correspond to which must be discovered. Championship Chatter – Which Came First: the Arrow or the Thermo? 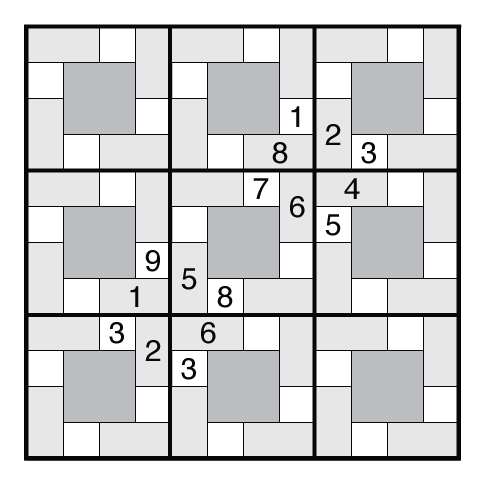 This puzzle was inspired by a comment I read somewhere of someone stumbling on a Thermo-Sudoku by solving it for awhile as an Arrow (or vice-versa, I can’t remember exactly). 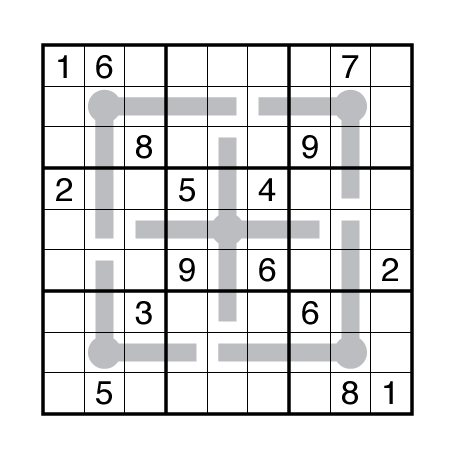 The goal was simple: can I make one puzzle that solves both ways depending on the type of shape placed into the grid. The theme here speaks mostly for itself. But if you want an extra challenge I’d recommend solving from these images (Arrow / Thermo) or PDFs (Arrow / Thermo) which contain the original draft of the finished puzzle. The arrow is probably a much better challenge as a result, but the Thermo is at the very high end of the difficulty scale and better for a slow solve than a competition solve. Fortunately there were a good set of symmetric positions that still matched with digits so I could add clues to both puzzles without spoiling the theme. Of course, almost all the remaining digits differ but I guess that is the point. Some people have asked about the construction steps to get two working puzzles of very different types. I normally design both of these styles by hand starting from an image of the shapes and then slowly adding digits. Here I simply did this at the same time for two different styles. The intention of having the centers work quite differently in the two types made the first four givens in the center the start. The 1’s in the corners were also great clue digits for both Arrow and Thermo types for different reasons. As I got some other good logical placements worked out, I did use some software tools to confirm each puzzle still had possible solutions before going too far down a dead-end. Gradually a duplicated puzzle came into form. Enjoy what were probably my favorite puzzles from the USSQT.